Two years ago 58-year-old Kuldeep Kumar Goyal received enough ration from the local fair price shop to feed his family of four. Goyal, a daily wage earner, lives with his wife Rajrani and two sons at Dhanas resettlement colony on the outskirts of Chandigarh. The family received 35 kg of ration (wheat and rice combined) per month under the targeted public distribution system. It was in February 2014 that the UT administration implemented the National Food Security Act, 2013 (NFSA), which provided 5 kg ration – 3 kg wheat and 2 kg rice at '2 and '3 per kg respectively – for each family member. This reduced the family’s overall food entitlement by 15 kg. A year later in September the administration replaced the PDS with a cash transfer system to transfer the entitlement. Since then, the couple is finding it difficult to provide a complete meal to their sons. “He [Goyal] hasn’t got work for a few days. We don’t have money to buy wheat flour. The flour container has been empty for a few days,” Rajrani said. The cash provided by the government doesn’t meet the family’s requirement, she said, as her husband took out a ‘yellow’ family ration card, at their one-room apartment. They paid Rs. 48 for 20 kg of ration under NFSA. Now to buy the same quantity and quality of ration they shell out Rs. 576 (as they buy 12 kg of wheat at Rs. 28 per kg and 8 kg rice at Rs. 30 per kg). Under the cash transfer the family receives Rs. 94.62 per head or Rs. 378 for the entire family. In sum they add Rs. 100-150 from their pocket to buy the same quantity and quality of ration. The empty container at Goyal’s house is an unintended but inevitable outcome of the subsidy rationalisation drive being carried out by the NDA government. A government appointed high level committee, headed by former MP Shanta Kumar, noted that the leakages in the PDS range from 40 to 50 percent. It recommended that the PDS should be phased out by direct cash transfer. It estimated that the cash transfer could save Rs. 30,000 crore to the exchequer. At present, the food subsidy under NFSA costs Rs. 1,24,724 crore to the government. The central government is pushing cash transfer in all UTs to begin with. It is giving two choices to the states, says Deepak Kumar, joint secretary, ministry of consumer affairs, food and public distribution. States, Kumar says, either install a point of sale (PoS) device in all FPS and do away with leakages and diversions and track every transaction. Or they go for cash transfer. “We have advised UTs to take up cash transfer based on demand from people. For others we said that you can start with urban areas and may be in small pockets, having surplus food grains. If there you start with cash transfer, no one will mind as there is no variation,” Kumar said. In January, Pradeep Kumar Sinha, cabinet secretary, took a review meeting of the status of cash transfer programme in all UTs. “The remaining UTs (saving Chandigarh and Puducherry) have been asked to expedite the cash transfer rollout,” an official, present at the meeting, said on condition of anonymity. A series of interviews with beneficiaries on the ground and public policy experts indicate the country’s unpreparedness in running a successful unconditional cash transfer. In Chandigarh this correspondent came across several families who are either not receiving cash subsidy or receiving it in some bank account but are completely unaware about it. There are also low-income families who have been completely left out as they haven’t been registered as NFSA beneficiaries. The Chandigarh administration has identified 56,000 beneficiary households under NFSA. After six months of its rollout, direct cash transfer covers only 43,183 beneficiaries. These households have their Aadhaar, bank account and their bank account have been seeded with Aadhaar. According to Chandigarh’s department of food and supplies and consumer affairs, the remaining 13,000 households are not receiving entitlement as “their bank accounts have not been seeded with Aadhaar”. The department officials failed to explain the rationale behind making Aadhaar seeding mandatory when the supreme court has ruled against it. Consider the case of Narayan Singh and his wife Sheela of colony number four, an industrial slum area. The couple, a beneficiary under NFSA, has provided their bank account and Aadhaar details twice to the food and supplies and consumer affairs department. For the past five months, they have been waiting for the subsidy money. Under the law the family is entitled to ration subsidy of Rs. 282 every month. When this correspondent approached the office of the food department at sector 17, the department’s computer programmer Vinay Verma acknowledged that there was an error. He said that the department would look into the matter. Fifty-year-old Wakeela and her husband Jafir, a daily wage earner, live in Dhanas rehabilitation colony. Their electricity connection has been cut off by the local authorities as the couple hasn’t been able to pay for the electricity for five months. To add to their woes, Wakeela said at their one-room apartment, the administration hasn’t transferred a single penny as their NFSA entitlement. According to the food department, the amount is being transferred to Wakeela’s ICICI Bank account, which was opened under the pension scheme. The couple, like a few other beneficiaries this correspondent came across, has no clue, however. Pyari (she looks over 60 but her Aadhaar card mentions her birth year as 1965) is a single mother who feeds her two sons and a daughter by working as a domestic help, earning over Rs. 1,000 a month. “I haven’t got my widow pension for five months. Nor I have received cash in place of ration that I received earlier,” Pyari said, standing with a group of women in front of her jhuggi. “I have made several trips to the sampark centre (a citizen facilitation centre), but they always tell me that the money hasn’t come,” she said, holding her Canara Bank passbook, ration and Aadhaar card in her shivering hands. In Pyari’s case too, Verma of the food and supplies department had the same explanation: cash was sent to ICICI Bank account! Certainly, it was yet to reach the destination. A survey conducted by the Delhi-based Centre for Equity Studies on cash transfer in Chandigarh between December 21 and December 27 highlighted people’s preference to ration vis-à-vis to cash. The CES team spoke to 200 beneficiaries across five different locations in the UT. “Close of 40 percent beneficiaries didn’t receive payment even after three months of the introduction of cash transfer,” Shikha Nehra, lead researcher with CES, said. Nehra said that around 71 percent of respondents opted ration over cash. Due to their low income and non-availability of subsidised ration, 32 percent of the beneficiaries had to buy ration on credit from the market, the CES report said. A leading economist with the World Bank said the case for cash transfer for ration is different from cash transfer under other social sector programmes including pension and scholarship. It is not a black and white situation, the economist said, as there are issues of use of cash for non-food purposes, inflation. The expert, speaking on condition of anonymity, said that both the systems have their strengths and limitations. There is no evidence to suggest that one system is better than the other. The success of cash transfer system depends on the functioning of food market, supply and availability of food grains, he said. In its studies, however, across developing countries including Sri Lanka, Ethiopia, Uganda and DRC, the World Bank has found that in places having cash transfer system the families have been able to bring a variety in their food consumption but not necessarily an increase in calorie intake. In places where the subsidy is being given in kind calorie consumption has been better, he said. “The governments can choose either way as long as they ensure calorie intake,” said the economist. “Poor families generally prefer food entitlements to cash transfers for a variety of reasons: inadequate banking facilities, fear of misuse of money, lack of faith in the government’s commitment to protecting cash transfers from inflation, and so on,” said Jean Dreze, a development economist, in an email interaction. It is not the poor, but the government who stands to gain from cash transfers, by saving money. “That is certainly a consideration, but people’s interests come first,” Dreze said. According to Dipa Sinha, advisor on nutrition, supreme court commissioners’ office on the right to food case, “Cash transfer puts the food security of poor families in danger. In the PDS system, these families at least have minimum ration. 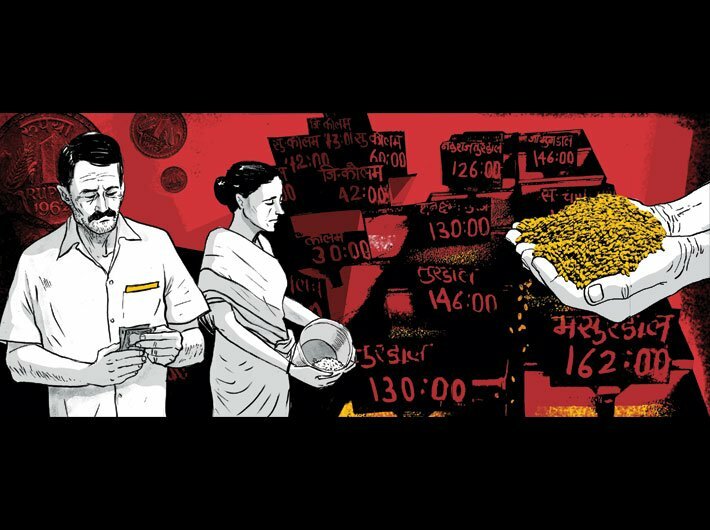 Even if they don’t get work and earn for a few days, they have some ration at home.” Then there are apprehensions about cash being used for non-food purposes, said Sinha, who also teaches economics at Ambedkar University, Delhi. What will happen to MSP? The issue of cash transfer might also severely impact the economic support system government provides to the farming community. If PDS is dismantled the government will procure less from the farmers, social sector experts said. “Because there is PDS there is so much procurement. If the government starts procuring only for buffer stocks, it will have to reduce its procurement,” Sinha said. Last year, the Madhya Pradesh government had expressed its reservations over cash transfer primarily on this ground. “MP procures in huge amount from the farmers,” said Ashok Verma, principal secretary, food department, MP. The whole PDS system on one hand provides cheap ration to the poor on the other it facilitates MSP to farmers, he said. Another reason why the state opted for ration and not cash transfer, said Verma, was patriarchy. There are concerns that men may spend cash on non-food purposes and there are numerous studies available to prove it, he said. The state has opted for second option under NFSA: end-to-end computerisation of PDS and deploying PoS terminals at all FSPs. The state has 22,400 FPS. “We have already deployed PoS in 13,000 shops and will cover the remaining by end of this month,” Verma said. “As we gradually link Aadhaar with PoS, our leakage will be zero,” he said. Andhra Pradesh is a pioneer on this front. It has already achieved 100 percent computerisation. It provides ration to beneficiaries after Aadhaar authentication, recording every transaction. Gujarat too has completely computerised PDS. Deepak Kumar of the food ministry said that close to 18 states have opted to deploy PoS at all FPS. These states are at various levels of implementation, however, he said. Sinha of the supreme court commissioners’ office said that the government is also underestimating the last mile access to banking. “Even today villagers have to leave one day’s wage and travel to a nearby town to take out money,” she said. A gathering of senior officials from the cabinet secretariat and finance ministry at a conference organised by DBT mission directorate also recognised the last-mile banking access as a major challenge in successful rollout of DBT. The availability of business correspondents in rural areas is still an issue. Inflation too is a major hurdle in introducing cash transfer in place of PDS. Government officials believe that the cash transfer should be linked to inflation index. Critics however take it with a pinch of salt. The government also promised to link pensions and other payments under welfare programmes with inflation, Sinha said. The beneficiaries are still being paid more or less the same amount they got earlier, she said. Back in Sector 25 in Chandigarh, 41-year-old Guddi, a single mother with three children, struggles to make ends meet, as she hasn’t received a single penny of ration subsidy even after six months of cash transfer. She works as a domestic help and earns Rs. 3,000 a month. “Initially (under NFSA) I received 10 kg of wheat and 11 kg rice,” Guddi said, while one of her son lay in fever on a double bed which occupies most of the space of her one-room jhuggi. “Ab advance leke kaam chalate hain (Now I take ration and other food items on credit from the shopkeeper),” she said.